Strawberries....mmmm, can't get enough of them! This summer has been great with a bounty of great tasting strawberries straight from the farm to my kitchen. I gorged on a lot of the berries, made strawberry jam with another lot and still had so much left over. I had to freeze them to keep them from going bad, it will come in handy when strawberries go out of season. This is another ice-cream you can hand crank at home without a machine. 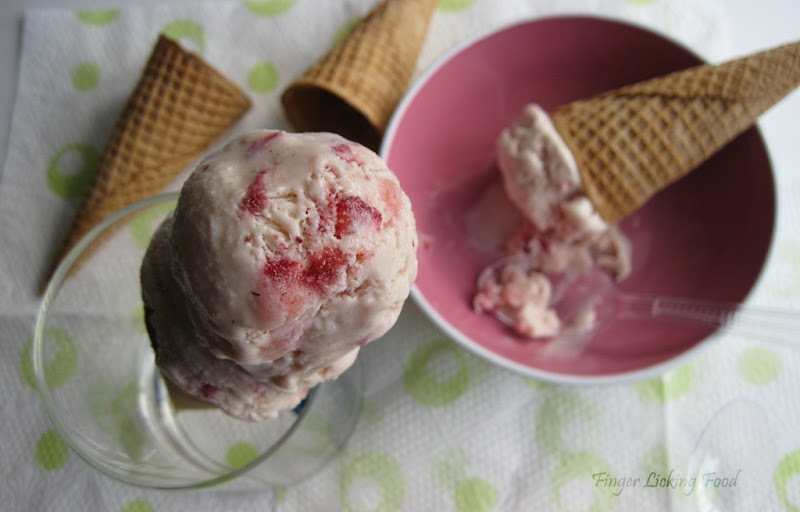 The mushy ones which I couldn't freeze went into making this strawberry ice-cream. After making Mango ice-cream at home I simply had to try strawberry ice-cream with fresh strawberries. Mix ½ cup of milk with 1 tbsp custard powder. Bring remaining milk and sugar to a rolling boil on medium heat. Turn down heat and then stir in the custard mix. Stir continuously for 4 minutes till the custard thickens and coats the back of your spoon. Remove from heat and let cool completely. 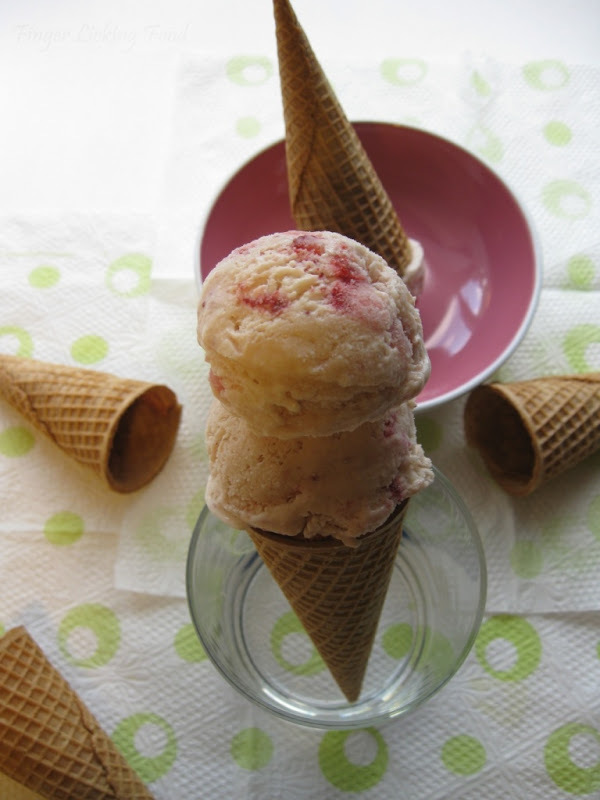 The procedure to make the ice-cream is similar to the Mango ice-cream (click to see instructions) When you whip the mixture the final time, stir in the chopped frozen strawberry bits. Transfer mix to a plastic container and freeze for 6-8 hours or overnight. The strawberry extract and the strawberry puree added a ton of flavour and I was really happy when the ice-cream smelled like strawberries :D The taste of course was undoubtedly strawberry-ey. Lovely pictures! 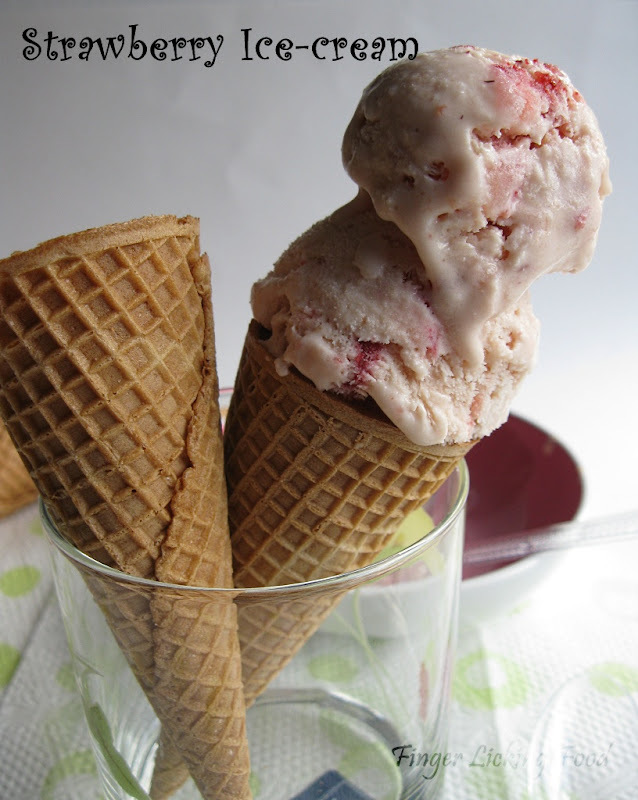 So droolworthy...am going strawberry picking over the weekend, will defn try and save enough to make this icecream. Temtping clicks and Perfect scoops, delicious! Yum, can you share a cone with me? wow! !this looks so much like the Baskin Robbins kinda stuff :) the whole set up looks so perfect!! clean and fool proof recipe there!! Gosh - that is just too darn tempting.